In fact, the iMessages that you just deleted still store in iOS SQLite database before other new texts overwrite the database. 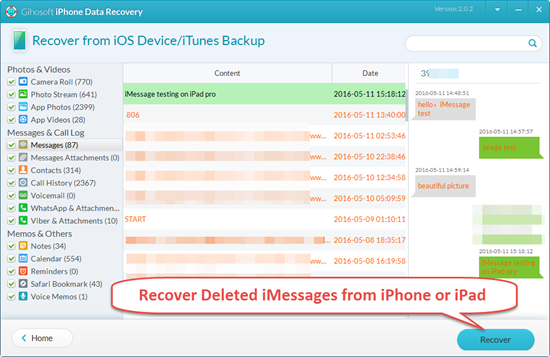 The fastest and safest way to recover deleted iMesseges is to use iMessage Recovery software. 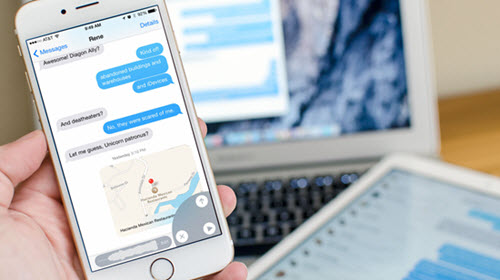 Here, Free iPhone Recovery is a good bet for you to get back deleted both iMessages and SMS. Note: Please turn on the airplane mode of your device in case that new messages from others overwrite iOS SQLite database. One solution is to remember that iMessage syncs across all your iOS and Mac platforms on which you activated it with the same Apple ID or iCloud Account. So if you use multiple devices, iMessages will be on each device respectively. For Example, in case you just deleted some iMessages from your iPhone, you can simply go to your iPad or Mac and the messages are there. And vise versa. If you can’t find the deleted iMessages on other multiple device, like the previous method, iMessage Recovery software is the best solution. Apple doesn’t save your messages unless you backup by yourselves. If you’ve recently backed up the whole device with iTunes or iCloud, you can restore data from backup to device, as will the old and deleted iMessages. However, this will restore your whole device to that backup date selected. Some data may get lost after that.